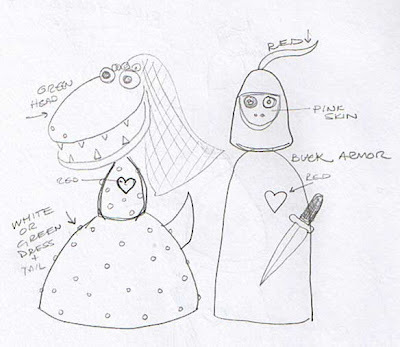 One day while trying to find something to satisfy my need for Gator Brideness I typed “gator bride” into Google images to see what would come up. 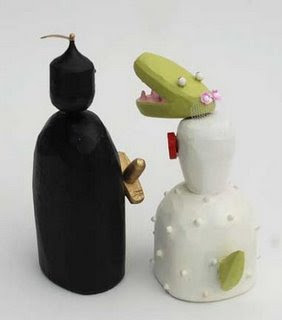 After rummaging through several pages of images I came across a super cute image of two wood carved gators, one with a top hat and the other with a veil made by bunnywithatoolbelt over at Etsy. 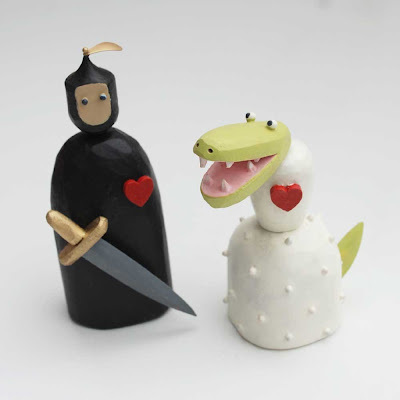 And..Wa-Lah our beautiful and character-ific cake toppers!!! Don’t you just love Miss. Gator’s mini veil? I can’t wait till these cute little toppers stand tall and proud (and did I mention cute?) on our wedding cake. Hillary at bunnywithatoolbelt was super easy to work with and did an amazing job. Be sure to check out her Etsy shop here for more handmade wedding cake toppers. 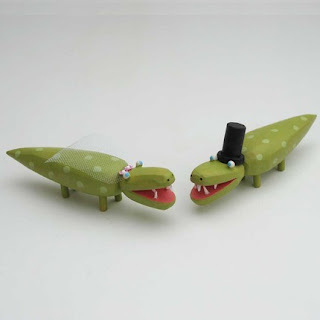 Just another unique and super fun way to incorporate gator lovin’ into your wedding! I can't wait either sweetheart. Great post! THIS is too cute. If only I had known about your website like 4 months ago! I have a friend who would have DIED for these. Congrats on finding the perfect toppers! !